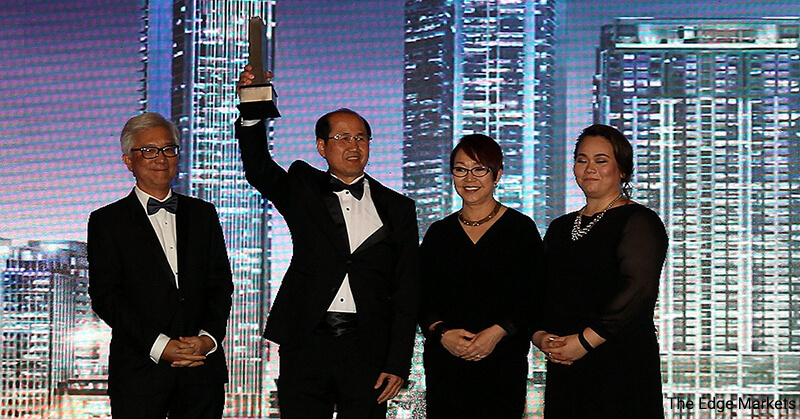 KUALA LUMPUR (Nov 1): S P Setia Bhd returned to the top spot in The Edge Malaysia Top Property Developers' Awards (TPDA) 2016, taking home the much coveted prize at The Edge Malaysia Property Excellence Awards (TEPEA) gala dinner held in Hilton Kuala Lumpur last night. S P Setia made its comeback to No 1 after a two-year absence from the spot having dropped to third and fourth position in 2014 and 2015 respectively. "We are delighted and honoured to be chosen by our peers in the industry," S P Setia president and CEO Datuk C J Khor said. "I would like to thank my team as it is a result of a teamwork and perseverance. It is everyone's efforts." This year's edition also saw a newcomer among the Top 10 — Eco World Development Group Bhd — occupying the sixth spot. Meanwhile, The Best in Qualitative Attributes sub-award went to Sunway Bhd (No 3) and UOA Development Bhd (No 7) was awarded the Best in Quantitative Attributes. The TPDA anchors TEPEA, which in recent years has expanded to include other sub-awards such as The Edge Malaysia Outstanding Property Entrepreneur Award, The Edge Malaysia Outstanding Property CEO Award, The Edge Malaysia-PEPS Value Creation Excellence Award, The Edge Malaysia-PAM Green Excellence Award, The Edge Malaysia Affordable Urban Housing Excellence Award and The Edge Malaysia Property Development Excellence Award. This year, a new category was added — The Edge Malaysia Pioneer Development Award — to recognise innovators of the Malaysian property industry whose development concepts initiated new trends in the property field. The selection of this award was made by The Edge. The rest of the Top 10 were IJM Land Bhd at No 2, Sime Darby Property Bhd (No 4), Mah Sing Group Bhd (No 5), Gamuda Bhd — Property Division (No 8), IGB Corp Bhd (No 9) and UEM Sunrise Bhd (No 10). The TEPEA gala dinner was held yesterday at the Hilton Kuala Lumpur, with more than 450 real estate players and experts coming together to celebrate the event. "For the Top Developer Awards we have both qualitative and quantitative evaluation," The Edge Media Group publisher and group CEO Ho Kay Tat said in his speech. "The qualitative evaluation is done by a panel of 10 judges who are industry personalities. In a way, companies are judged by their peers. To mitigate the risk of biasness, judges abstain from casting their scores for companies where they are conflicted." The scores and rankings were audited. The Edge Malaysia Outstanding Property Entrepreneur Award was presented to the founders of Glomac Bhd — Tan Sri FD Mansor and Datuk Richard Fong — to honour industry captains who have made significant and outstanding contributions in growing their companies into a dynamic player at the forefront of the industry. There were two recipients of The Edge Malaysia Outstanding Property CEO Award this year — IJM Corp Bhd CEO and managing director (MD) Datuk Soam Heng Choon and Gamuda Land Sdn Bhd MD Chow Chee Wah. The award recognises CEOs and professionals whose leadership has taken their companies to extraordinary heights. The Edge Malaysia Property Development Excellence Award went to Eastern & Oriental Bhd's Seri Tanjung Pinang in Penang, IJM Land Bhd's Seremban 2 as well as Malaysian Resources Corp Bhd's KL Sentral in recognition of their positive contribution to the vibrancy of the surrounding areas. The Edge Malaysia-PEPS Value Creation Excellence Award recognises developments that have provided outstanding rewards to their purchasers in terms of capital appreciation. This year, the residential category was split into two sub-categories: below RM400,000 and above RM400,000. This year's winner in the residential category (below RM400,000) was Paramount Corp Bhd's Pangsapuri Kemuning Aman, while the merit award went to Parcel G @ Pelangi Seri Alam by MKH Bhd. Meanwhile, the residential category (above RM400,000) was won by Sime Darby USJ Development Sdn Bhd's Avani Bandar Bukit Raja in Klang. The merit award went to Enya, Ambang Botanic 2 by Gamuda Land (Botanic) Sdn Bhd. The Edge Malaysia-PAM Green Excellence Award was jointly created with the Malaysian Institute of Architects to recognise projects that demonstrate sustainable design innovation while contributing positively to the community. This year's winners were Edusar Resources Sdn Bhd's University College of Technology Sarawak and Technology Park and Sime Darby Ara Damansara Development Sdn Bhd's Masjid Ara Damansara. The Edge Malaysia Affordable Urban Housing Excellence Award, which honours affordable housing projects for the urban middle-income group undertaken wholly by Malaysian private developers, was awarded to Seri Kasturi Apartment by Bandar Setia Alam Sdn Bhd. SUCI at Bandar Ainsdale by Sime Darby Property Bhd, meanwhile, won the merit award. Partners of TEPEA this year were Jotun Paints Malaysia, USG Boral and Volvo Car Malaysia. Presented by City & Country, the weekly property pullout of The Edge Malaysia, the awards is supported by TheEdgeProperty.com, the one-stop property portal that offers free property news, data and analytics.